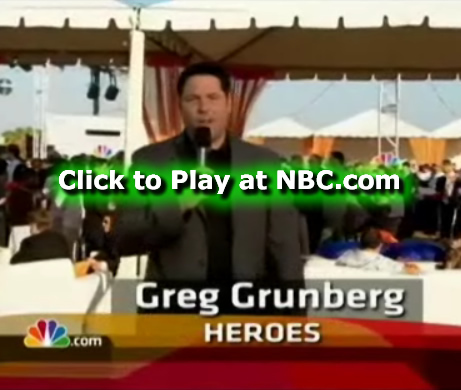 Get better acquainted with NBC’s primetime lineup as host Greg Grunberg (HEROES) walks us through all of NBC’s fall schedule, night by night. Get a look at some of the new shows: CHUCK, JOURNEYMAN, BIONIC WOMAN, and LIFE, …as well as some of your returning favorites like THE OFFICE, 30 ROCK, FRIDAY NIGHT LIGHTS, HEROES and more. Special guests include the stars of NBC’s new lineup and a few familiar faces that you just might recognize. For me, it was worth watching just to see the sneak peek at HEROES!! I can’t wait for season 2 to start!! Click the image below to watch the video in full over at NBC.com. Or if you’d prefer to watch it in bits and pieces, NBC has uploaded the video to their page on YouTube.